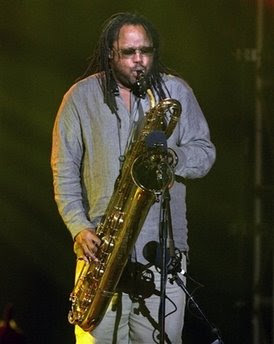 I just wanted to type a little blog post as a tribute to the life of LeRoi Moore, the saxaphone player from Dave Matthew's Band. He died yesterday due to complications from a car wreck he experienced in June. Although I enjoy the band's music from time to time, my enthusiasm is nothing compared to that of my brothers. They have always been huge fans. My brother Collin is a saxaphone player (a very good one, may I mention) and was greatly influenced by Moore's style. Evan used to (and maybe still does) practice his drums to the band's music. (He's good too. :) ) The two of them are pretty upset, according to my mom. (I don't know about my other brother, Aaron...I wouldn't be surprised if he's upset too. And just in case he reads this, he is also a good drummer. :) ) Collin and Evan were members of a band with two of their other friends (I have their CD if you want it..it's good!) and their music was also influenced by the Dave Matthew's Band. So I know they're really bummed. I'm not sure how this will affect the future for DMB, but in any case, I did want to post a little blog and let my brothers know that I feel for them.